It was a full house at the JRD Tata Sports Complex, Jamshedpur, as the home team Jamshedpur FC took on FC Goa in the second last, and the most exciting league game. But this wasn’t the only time with a packed stadium, the debut season for Jamshedpur FC has seen full house in all of the eight games that the team played in the steel capital of the country. It was an historic day when the team played its first match in Jamshedpur, a city whose foundations were laid by a visionary, who went on to build one of the largest and the most successful conglomerates of the world. And with Jamshedpur FC, TATAs ventured into the ever-growing professional football arena. However, at no point we can call it as the first step of the TATA’s into Indian Football. The existence of the Tata Football Academy (TFA), which again is located in Jamshedpur, is an epitome of footballing excellence of the country. The academy has crafted and created some of the best footballing icons of the country, and even in this season of the Indian Super League (ISL), cadets of the TFA, shone the brightest amongst the lot. Jamshedpur FC, is just an extension of this excellence, with the TATAs venturing into the competitive league system of the country. Coming to the city, Jamshedpur can’t exactly be called a sleepy small town. The city is always abuzz, may be not with what us the metropolitan crowd would call chilling, but with the warmth of the residents of the city. 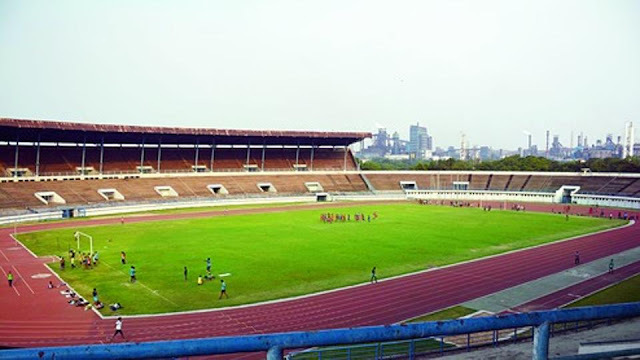 The area’s surrounding the stadium and the headquarters of the TATAs are well planned, very similar to the city of Chandigarh. You could feel the vibes of similarity between both the cities across the circles at the road junctions. And the iconic steel plant? Well, it engulfs the whole city. In fact, the city dwells around the steel plant, because it owes its existence to it. So, does the stadium. Roads in Jamshedpur are quite well maintained, malls and cinema halls are well furbished. The pizza place on top of one of the most prominent hotels of the city serves one the best pizzas that I have ever had while the coffee shop right next to it, serves delicious hot chocolate with flavours that one usually doesn’t find. The city in fact has a little bit of colonial hangover, with the rich crème of the city leading a luxurious lifestyle, while the middle class and the strata below it has the colourful bazars and streets to them. So, when the Indian Super League came into the city, it became one of the most happening events that the city has ever seen in decades. The coming of the ISL led to huge excitement in the city and probably for the first time ever, all sections of the city could come into one complex and enjoy the same source of entertainment. The effluents had their places to go, but this time around, everyone in the city had the option of viewing football, the most beautiful game, sitting together. Everyone in the city wanted to be at the JRD Tata Sports Complex. 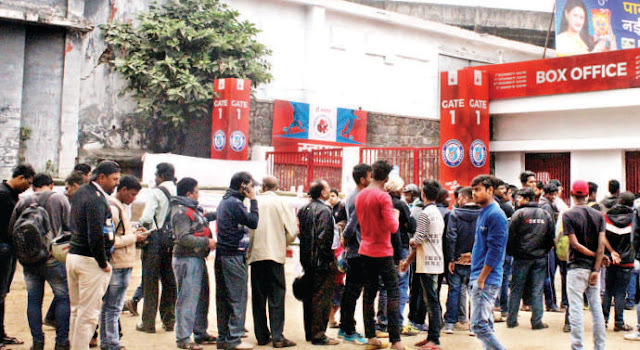 Long queues could be seen at the ticket counters with the curiosity being fuelled by hoardings and banners across the city. Come and support your team, that was the indirect message. More importantly, Jamshedpur FC gave the entire city something to cheer upon, something they can relate to. It did not take the long enough for this curiosity to turn into raw passion as in the last league match, fans stormed the stadium to cheer their team into the play offs, right in their debut season of the league. Initially, the curiosity revolved around the gilt, glamour and the sparkle that the league got into the city, but for the best of us all, it did turn into raw football passion with crowd holding banners and posters of their favourite football icons of the team and even of the coach. 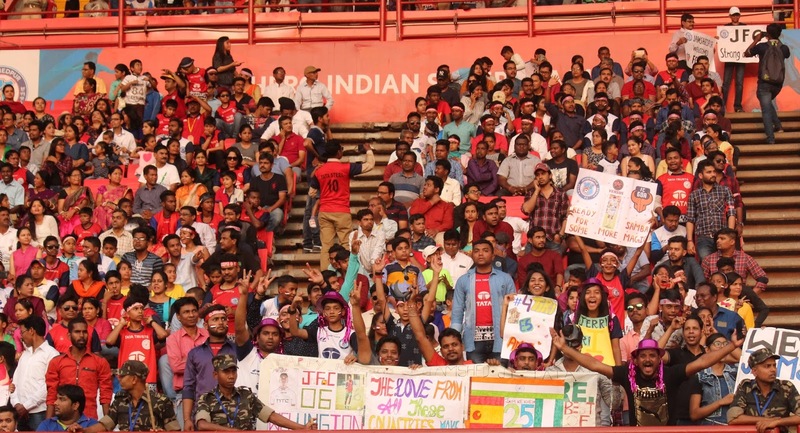 But what struck me the most was the attitude of the Jamshedpur fans. In India, we reside around the idea of free/complimentary passes. We just love them, don’t we? The stadium in Jamshedpur employs lot of workers who take care of its maintenance, most of which are women. On match days, when their work got over you could see a majority of them standing at the box office to get tickets for their family. With them having seen the magnitude of preparation for the match, they naturally became very excited to have their family watch a game at the stadium. But not everyone could get tickets, mostly because its sold out. And hence a lot of them came to the organizers or the club to ask for tickets. Completely unknown to the concept of complementary tickets, some of these workers offered mone. A proper football experience is worth some money, and a daily wage earner, who probably earns a fraction of what we do, understands it. This was probably the biggest take away from Jamshedpur. It was a wonderful season, a long one too. Jamshedpur has always been in the professional football map of India, but this time around, it made its another historic big leap. There countless other experiences that one can just go on and on. Be it the excitement of the lobby boy at one of the team hotels, who did an overtime shift, just to meet and get a photo clicked with Dimitar Berbatov, for he was a Manchester United Fan, or the 'fortunate' bus driver who drove the home team. There are so many tales of ISL coming to the city. So long Jamshedpur, this is just the beginning.